I tested for how many characters are saved by digrams, trigrams, and "tion" in the total word list (2220 words with lots of typical repetition on common words, total 10010 characters). It looks like about 26 percent reduction. Not like a Stenotype machine, but I still think after a couple of years I might be faster one-handed than two! Yay! By UTF-8 I mean characters 33-126. Not like a Stenotype machine, but I still think after a couple of years I might be faster one-handed than two! Yay! Even if that does not happen, you do get to use your other hand for other things, like using mouse or drinking coffee or tea. Yup. Or to click on letter frequency websites. Actually what has been most interesting about this slow journey is that I have a side interest in cognition and procedural (muscle) memory ... I have been paying attention to the exact point, for each letter or digram, when I switch over to subconscious processing. Haven't taken time to document though. My most accurate and easiest recall is the complex patterns, but it is still A/E, S/R and N/L that I mix up the most, though they are the simplest patterns. They are not unique enough for me to master quickly. when I switch over to subconscious processing. Haven't taken time to document though. This sounds very interesting. It would be interesting to know more about this. but it is still A/E, S/R and N/L that I mix up the most, though they are the simplest patterns. They are not unique enough for me to master quickly. To deal with small frequency problem, I usually make my own exercises that have only the words/patterns I want to learn. That's how I have learned and re-learned a lot of bigrams as they were evolving in BackSpice layout. It turns out that the Twiddler typing tutor helps me the most with the simple mixups. For I while I felt like the tutor was holding me back, by making me repeat the "et" "at" combinations, but I need the repetition. I tried the same exercises with my office keyboard, on which I do not make many mistakes, and realized that in the future when I get to the more complicated patterns I will go relatively faster. What really surprises me is that, although I tend to make a mistake and continue typing, I will subconsciously realize my fingers got ahead of my brain. The "significance" of something goes to your frontal lobe (over your eyes) at the same time that the center part of your lizard brain is sending a signal down to your muscle. So I type "e" for "a" or "s" for "r" and then usually know I have to go back and fix it, without ever looking at the output. No guarantees for accuracy, but when I pull out the Digid trigrams and then digrams for Mackenzie's typical 500 phrase, these are their rank. I compared to the sample from the twiddler site for all digrams from English novels ... my digrams miss out on ne, si etc because I use those MCCs for en, is etc. But I hit 4000 letters out of 10000 letters total in .Mackenzie's list. Not too shabby. Progress report on Digid (keymap based on 5-bit visual chording diagrams rather than a “home row” like the default mapping or single key mappings). o	I have mastered, and get a lot of extra speed from, almost all the 50 bigrams and trigrams I mapped, and I am surprised at how consistently I remember to use them. o	I definitely feel more confident remembering multi-stroke strings like “ck” (in my head I see “SCC then 2CC on rows 2-3 of left column,” which is an easily visualized pattern for oLoo->oLLo). o	This is the same phenomenon as when we read; we do not read individual words, but instead remember long and distinctive phrases we encounter often. o	My most common errors and the ones I have the hardest time eradicating are short, symmetrical SCCs, especially confusing “d” and “n” (both are single characters centered in the right column, ooRo and oRoo) and “a” for “e” (ooMo and oMoo). o	Short common 2CCs are also easy to reverse: “s” and “r” (2CCs on rows 3-4, and ooMM). In an article I typed on writing I spelled it “wsiting” or “wsitesr” practically all the way through. If I use a bigram or trigram MCC that is not derived directly from the characters (i.e., “ir” is like “I+,” and “en” is like “e+f” and “com” is like “c-f-a”) I get disoriented if I immediately repeat the final character “r”, “n” or “m”, which I have to remember has suddenly “moved” back to its familiar location. o	The saddest casualties were the surprisingly common combinations with “c” and “L” (oRRo, which cannot combine with “A” ooMo or “e” oMoo) but we can’t have everything. o	Folks, ignore all the research that says “H” is a common character. Eliminate the common bigrams and trigrams and you seldom run into it. o	“J,” RRRR, is just painful for me to key with my left hand. But my graphic logic said that is where this seldom-used letter had to go. There IS a god. o	Stutter, hitting a character twice, is my second most common error. o	By having mapped most of the possible MCCs, I almost always encounter some output when I hit the wrong keys; the penalty for my low dexterity and 50 bi/trigrams is a lot of backspacing. o	I “remember” errors (i.e. I notice them as soon as I hit the key); if I start out keying slowly then I can correct errors before entering, and it turns out that with experience the errors are only dexterity problems and not cognitive. o	I was lucky that my digigraphs did not lead to a lot of hard-to-strike multicolumn chords like LRLM. o	Good placement is critical (3CC on right column oRRR). o	I was lucky with punctuation, especially by concentrating it on the left column or using “r” (**MM) or (***M) as a typical set-key combination. o	Directional MCCs (whose angles feel like they “point” left or right) work well for muscle memory, including arrow controls and bracket/brace/para character pairs. o	I found I got no benefit from including in the bi/trigrams. o	Generally the bigrams either start or end in “a” or “e,” but few duplicate consonants, so it is not hard to decide which multigram combination to use. “Has” as “ha-s” is easier than “h-as,” but this sort of ambiguity seldom comes up. Nice report! Thanks Mike. Looking forward to the next. I called this "walking". Off the top of my head I can't remember which config, but I got this idea from a config someone posted here that uses this for almost all letters (which are mostly 2KC). In the config, more common bigrams had a walk. "I found I got no benefit from including SPACE in the bi/trigrams." Aside from letters, I single-column the MCCs for comma, period, single quote, question mark, dash, backspace, tab, enter, slash, space, 0, 5, !, and ?. Single-column is a godsend for me. I am pretty sure the enclosed is my final (I traded "er" for tab, and tweaked some of the **MM and **LL special characters); I cannot think of anything else that will speed me up. I wish there were a control population to test MCC speed versus muscle memory speed (aside from the N=2 sample size of lancegatlin and AlexBravo). I am growing more and more convinced that even keyers with better dexterity than mine can get speed with MCCs. Though court reporters keying Consonant-Vowel-Consonant MCCs memorize their own personal set of shorthand abbreviations to gain speed, their using two fingers and thumb simultaneously gets them a lot of gain (300 WPM record, if I remember correctly) I think I can simulate about half of their shortcuts based on the MacKenzie word list I posted, even if I don't have the option to leave out a lot of letters the way a court reporter would. Stenography is different than MCCs. Steno "types" (they call it writing) one spoken syllable all at once (they call this a "stroke") by pressing multiple keys at the same time (aka chording). It requires a computer interpreter of some sort to convert typed syllables to written words since spoken language is only ~98% unambiguous (e.g. homophones reed vs read or compound words e.g. some vs somewhere). Each button is associated with a sound, not a written letter. Example: there is no "C" in steno only "K" and "S" since written C makes either an S or K sound. The left hand buttons form the starting consonant sounds of a syllable (onset), the thumbs form the vowel cluster (nucleus) and the right hand forms the ending consonant sounds (coda). There are duplicate sound buttons between the left and the right hand. Example: pat -> left hand P, thumbs A, right hand T. Example: rare -> left hand R, thumbs LONG A, right hand R. Space is automatically prepended. Also, there are many steno systems. The one I've described above is the only one I've learned a bit of, OpenSteno. Stenography has been paid only system sold by corps to court reporters for most of its existence. OpenSteno is newish (4 years old?) and is first open source free steno system and interpreter software. From what I've read steno can increase typing speed 2x to 3x for most users, but it takes a significant amount of training, requires 2 hands and requires special steno keyboard for fluent use (they do sell very cheap kits (~$15?) 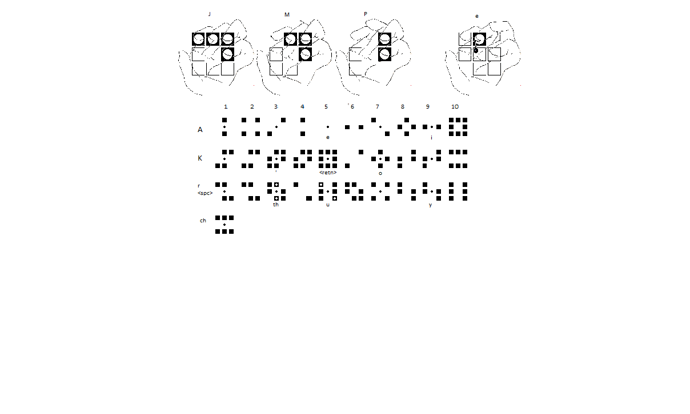 for learning steno on regular keyboards). There are some open source steno keyboards that are reasonable ($100-$200) compared to professional steno machines ($1000-$5000). I'm using MCCs in my current setup. It's very difficult to tell if they are overall faster for me. It feels to me that end of the day, muscle memory rules all other factors. Trained muscle memory for MCC is faster but you can't not train the letters, so it's more training work. Also, one must also train the decision point to use the MCC instead of the first letter of the MCC. This required me to start to look ahead at what I was typing. Not muscle memory per-se but definitely more training effort to not pause while deciding MCC or letter. Finally, Twiddler's implementation of MCCs is very slow and it ignores buttons pressed during MCC playback, basically negating any marginal speed-up from MCCs. MCCs are still convenient though, less effort. That look-ahead is a really interesting question. I have so many "a-,e-,I-" look-aheads that it almost is not an issue, and that is how I counted the number of bi/trigrams from the 500-phrase sample (find trigram, then find bigram, if fail find bigram, do not look ahead). Therefore "these" is always "the-s-e" never "th-es-e". But think about your own multigrams that you must have committed to muscle memory by now. You don't have to stop to consider whether "ing" is a trigram before you eliminate "in" as an option, do you? You see "the" before "th"-"e", right? I was very, very surprised at how quickly I committed the multigrams to muscle memory (actually the caudate nucleus, sort of a vertical mirror image of your hippocampus but it loads up your frontal, action, lobe instead of your temporal, speech, lobe). I just haven't found myself having to pause and debate about multigrams after a few months. In fact, it is my NOT pausing before my "r" vs. "s" choice that is making me so error prone. Thanks for the OpenSteno lead! Therefore "these" is always "the-s-e" never "th-es-e". This mini analysis (and the practice to commit to muscle memory) has to be performed for every word containing MCCs. It has been my experience so far that to achieve fluent typing speeds I have to practice new words individually until the proper MCC(s) are being typed fast and accurately enough. This means a very large amount of training time compared to no MCCs. It also means when typing words I'm not as familiar with I am suddenly slow again. I've also been looking closer at "extreme typists" who exceed 120 WPM. They do this with no MCCs. Also the community of fast typers would probably have started using MCCs if they are better. Chording can be done with a number of software tools and standard keyboards. I have about 50 MCCs committed to memory. What is deceptive in the beginning is the usefulness of common MCCs like THE, ING. Those two are the most common and easiest to learn and most useful. They are the most effective of all my MCCs but all further MCCs suffer from diminishing returns. Ironically, the more a -gram is typed char by char the faster the muscle memory gets. With no MCC both THE and ING quickly become very fast. This is why I say it is very hard to tell if there is really an overall marginal gain for any MCC. Also, when I say pause, I don't mean I stop typing to think (generally). I mean there is measurable delay (e.g. >200 ms) in time to press the MCC compared to typing the first char of the MCC. My guess is that delay is from the decision of selecting the next chord from a set of possible next chords happening in muscle memory.